BFPD had a medical Assist on Michigan Avenue. Patient was transported. BFPD responded to a power line down/arcing, nothing was found on arrival. BFPD was cancelled en route to a MVA on the interstate. BFPD responded to a medical assist on Spartan Avenue. The patient was transported. BFPD responded to a medial assist on Iowa Avenue. Crews assisted family and cleared. BFPD responded the request of Berthoud PD for a standby. Berthoud Fire was cleared upon arrival. BFPD responded to an MVA on Rosewood Avenue and County Road 17. Berthoud Fire checked for injuries, cleared all hazards. A patient was transported. BFPD responded to medical assist on County Road 17. The patient was conscious upon arrival and was transported. BFPD responded to a medical assist on Mountain Avenue. The patient was conscious upon arrival and refused transport. BFPD responded to a medical assist on County Road 8. The patient was transported. BFPD responded to outside rubbish/trash fire on Weld County Road 1. Crews distinguished fire and cleared. BFPD responded to a call for medical help on Second Street and Mountain Avenue. The fire crew assisted loading the patient for transport. BFPD assisted a citizen on East County Road 8. BFPD responded to a commercial fire alarm on First Street at a medium sized warehouse. There were no signs of smoke or fire, but alarms were activated. This proved to be a false alarm and the system panel was reset. BFPD responded to a two-vehicle accident on Interstate 25 at mile marker 253. There were no reported injuries. BFPD responded to a medical call on Jones Place for a female having seizures. Upon arrival of Thompson Valley Emergency Medical Service (TVEMS), patient care was transferred to them and the Berthoud Fire crew was released from the scene. BFPD responded to a reported structure fire at 1385 Weld County Road 36. Initially two engines, a 75’ ladder truck, and TVEMS ambulance and supervisor responded, before their arrival a request for an additional engine was requested from Loveland Fire/Rescue. Additional resources were requested from the Mountain View Fire Protection District and Loveland Fire/Rescue. Johnstown Fire Protection District was called to staff Berthoud Fire Protection District Station 1. Firefighters fought a very difficult and dangerous fire; upon entry to the residence they found fire in the attic and crawl space. A total of nine firefighting apparatus responded to the scene, as well as one command vehicle. More than 40 firefighters fought this fire for more than 2 hours before it was extinguished. The 3200 square foot residence suffered extensive damage as did the contents. The fire was investigated by the Berthoud Fire Protection District with assistance from the Alcohol Tobacco and Firearms (ATF). Agents were called in to assist, as they have on many accidental fires in the past, with the investigation as a courtesy to the Berthoud Fire Protection District. The cause has been determined to be accidental in nature. BFPD responded to a reported bomb scare on County Road 15 and County Road 2. The reporting party heard a ticking noise coming from an object. After investigation, it was determined to be an electric fence making the ticking sound. BFPD assisted with a medical call on Shelby Drive for diabetic problems. The patient was not transported. BFPD responded to a report of smoke and odor on West County Road 10E. Upon arrival smoke was coming from a stove pipe, but no unusual odors. After investigation, no problems were found. BFPD responded to a vehicle fire on Interstate 25 just south of the Berthoud exit. A vehicle was found with smoke and flames showing near the rear axle. The fire was coming from the fuel tank and was quickly extinguished. BFPD assisted with a medical call for a patient who had fallen. The Berthoud Crew assisted TVEMS with loading the patient for transport. BFPD responded to a medical call for a patient on Highway 287 @ mile marker 327. The patient was transported. BFPD responded to an outside gas odor on West County Road 10E. A gas meter had been hit with an object causing a crack in the meter, resulting in the gas leak. Excel Energy was notified. BFPD responded to the Valley Dirt Rider track for a motorcycle accident with injury. The patient was transported. BFPD assisted with a medical call on West County Road 8E for back pain. The patient care was transferred to TVEMS. BFPD responded to a small ditch burn on Paramount Drive. The fire was extinguished. BFPD assisted TVEMS with a medical call for a patient on West County Road 12. The patient was not transported. BFPD responded to County Road 21 and County Road 4 for a motor vehicle accident involving three vehicles. One patient was injured and transported. BFPD assisted with a medical call on Willshire Drive. The patient was transported. BFPD assisted with a medical call on Brehm Road. for a patient having breathing difficulty and chest pain. The patient was transported. BFPD responded as mutual aide to a building fire in the Lyons Fire District. 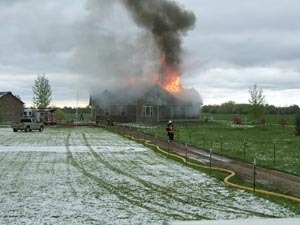 The Berthoud crew assisted Lyons Fire with extinguishing the residential fire. BFPD assisted with a medical call for abdominal pain on North US Highway 287. The patient was transported. BFPD responded to a motorcycle accident on Interstate 25 @ mile marker 251. The motorcyclist was injured and transported. BFPD responded to a reported grass fire near a ditch in the area of County Road 15 and County Road 2E. This was a smoldering pile of limbs as a result of an earlier ditch burn. BFPD responded to a possible vehicle fire on Interstate 25 @ mile marker 252. A vehicle was found that had overheated with steam coming from the engine. BFPD responded to a medical call on Sundown Court. The crew assisted TVEMS with loading the patient for transport. BFPD assisted with a medical call on Mountain Avenue for a patient having severe abdominal pain. The patient was transported. BFPD responded to a medical call for a patient having chest pain on Gateway Park Lane. The patient was transported. BFPD assisted with a medical call at Berthoud Living Center. The patient was transported. BFPD responded to a motorcycle accident near Dam 1 at Carter Lake. Two patients were injured and transported. BFPD responded to a medical call for a broken ankle injury on First Street. The patient was transported. 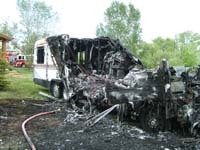 BFPD responded to a vehicle fire involving a large motor home on County Road 4. The vehicle was between two structures but not threatening the structures. The fire was fully engaged upon arrival and was extinguished quickly. The fire investigator responded to the scene to perform a preliminary investigation. An occupant of the home was treated for minor burns. BFPD assisted with a medical call on First Street. Patient care was transferred to TVEMS upon their arrival. Site contents copyright © 2019 Recorder Online	except as noted. All rights reserved. | 96 queries in 2.415 seconds.